While there is a lot of off the field “stuff” going on in the NFL I have decided to try to not say too much about it for multiple reasons (one being I would rather not get in trouble). The domestic violence discussion is one that needed to be had and I am glad it is now being had in some form or another across the country. That being said you always see power rankings by team, so I thought it would be interesting to rank the NFL by division through Week 3. I ranked each division based on a couple things: number of potential playoff teams and overall depth in good teams. So just because one of the remaining unbeaten teams are in a division does not mean the entire division is good. Here we go. Clearly the leagues best division that number could have been 4 if Bradford didn’t get hurt. Right now the Seahawks and Cardinals look like locks for the playoffs with the Niners fading quickly. San Fran started this way last year and still made a deep playoff run so I am not counting them out just yet. Atlanta looks like the best team in this division right now even though many people had New Orleans in the Super Bowl at the start of the year. The only team not potentially in the playoffs is the Bucs (who I may or may not have had getting one of the Wildcards before the season started. Carolina looks okay now the Cam is back and I am confident New Orleans will battle Atlanta for the division crown. I use decimals because the Steelers’ fate is still unknown. They are talented enough to make a playoff push, but I am not sure that team can sustain good play long enough to get in. 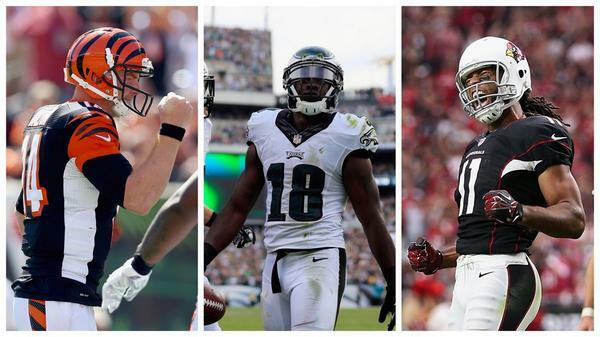 The Ravens and unbeaten Bengals look like competitive, grind it out teams that will be near the playoffs all season. Unfortunately the Browns seem to be that team that will be in every game but come up short and finish 6-10. Denver headlines this division with San Diego right behind them. Phillip Rivers is legit and so is that Charger defense. I do not think it is so clear which of these two teams will win this division. Stay tuned. Kansas City seems to have fallen off and Jamal Charles can’t stay healthy once again (sorry fantasy owners that took him third overall). Oakland is still a long ways away and does not even deserve to be mentioned in the same sentence as the word playoffs. But their young qb…one of the Carr brothers… looks like he could be the long term answer for that team. The most up in the air division from top to bottom at the start of the year has started to shake out and my Eagles have somehow remained unbeaten through three games. The Cowboys are quietly (as quietly as possible for a Jerry Jones’ owned team) behind the Eagles at 2-1 and have shown signs of being an elite offense now that they have figured out they can actually hand the ball off more than 20 times a game. The .75 is for the Cowboys who will find a way to mess up this season too. The Giants and Redskins are barely holding on and that QB controversy in Washington keeps getting more and more fun to talk about. This division is still a fight between three teams with Minnesota becoming more intriguing by the day as Teddy Bridgewater is now their starting QB. Green Bay looks like a 7-9 team if everything goes right and have somehow forgotten how to run the ball (sorry you Eddie Lacy fantasy owners). Chicago has very little secondary left but can flat out pass it. Cutler looks very good, Marshall and Jeffry are elite receivers and Bennett has been a beast these first three weeks. The Lions are interesting and will hang around, and having Megatron always helps. The only good team in this division appears to be Indy lead by franchise QB Andrew Luck. Houston had a chance to be a playoff team (hence the .5), but Ryan Fitzpatrick is slowly throwing any chance they had to the opposing team week by week. Tennessee and Jacksonville weren’t expected to be good this year, but both have shown signs of improvement. I like Bortles and it will be interesting to see him actually on the field for the next couple weeks. The Pats are going to coast into the playoffs for what feels like the 20th straight season (thats an exaggeration, I know Jets fans). The Jets should be better than they are, but Geno Smith is still experiencing growing pains which is normal for a young QB. That Dolphins and Bills defenses are good, but they both have problems at QB which means 6-10 is their ceilings. The Jets are that .25 of a playoff team that have a long shot of squeaking in on the final day of the season. This entry was posted in Home, NFL and tagged Division, NFL, Playoffs, Power Rankings, Unbeaten Teams. Bookmark the permalink.